Barcelona's 4-0 El Clasico victory at Real Madrid will "go down in history", according to coach Luis Enrique. Luis Suarez scored twice and Neymar and Andres Iniesta also netted as Barca - for whom Lionel Messi was a second-half substitute - went six points clear of Real at the top of La Liga. "This victory tastes glorious because it is against our eternal rivals," said Enrique, who played for both sides. "It will be very difficult for us to better this performance." Barca were as dominant as the scoreline suggests and could have won by more goals. Enrique added: "Winning like this against players of such a high level is difficult, but we managed to pull off what we were hoping to do throughout the game. "I don't think Real Madrid gave up. We were a level above them and we outnumbered them in many areas of the game. The game is more of a reflection of our merits than Madrid's faults." Messi, returning after nine games out because of a knee injury, had a hand in Suarez's second goal - Barca's fourth. Suarez and Neymar ensured Barcelona did not miss the Argentine too much during his two months out, scoring all 19 of the club's La Liga goals before Iniesta struck at the Bernabeu. Enrique had said in his Friday news conference that he would wait until the last minute to decide whether to start the club's all-time top scorer. But speaking after Saturday's game, he said: "I decided it during the week and I wanted to get feedback from him. It was a relatively easy decision to make, and Leo also understood it." Barca captain Iniesta, who scored and assisted in a Clasico for the first time, called his side's performance "complete". "We wanted to win by the highest goal difference possible and the bigger the distance the better," he said. "Our lead is six points but it is not decisive. There's a long way to go." Iniesta was given a standing ovation by the home fans when he was substituted, and said: "I am grateful for the applause." 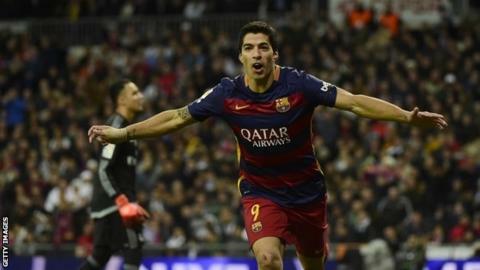 Suarez said: "We are six points up against a direct rival but there's a lot left. I'm thrilled. These games are double the fun and I'm very satisfied."